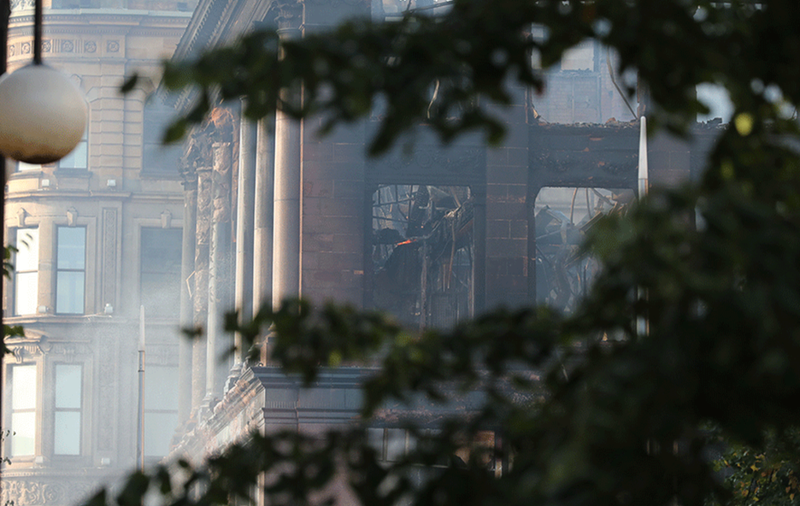 ONE of Belfast's most iconic buildings was reduced to a charred carcass yesterday after an inferno saw the heart of the city closed for most of the day as firefighters battled to contain the blaze. Shoppers, staff and contractors carrying out extensive renovations at the popular Primark store in The Bank Buildings at Castle Street fled to safety after smoke alarms sounded at around 11am. 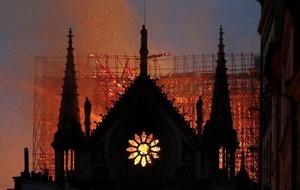 It was suggested last night that a spark from construction work on the roof of the building was the cause of the fire. Eleven fire appliances were originally dispatched to tackle the fire on the roof of the 233-year-old building, a number of firefighters initially gaining access through scaffolding that had been erected as part of the building work. Within an hour, the billowing plumes of smoke had given way to leaping flames and police were expanding their protective cordon from the immediate vicinity of the building, down to Fountain Lane one one side and Castlecourt on the other, as the heat began to build. At lunchtime, 14 fire appliances and 80 firefighters were battling the blaze and residents and businesses in the city centre were being advised to keep their windows and doors closed "as a precautionary measure", as the area became enveloped by a large plume of smoke. By 4pm even more resources had been deployed and the cordon was moved down to the junction of Royal Avenue and North Street as concerns gathered for the structural integrity of the building. 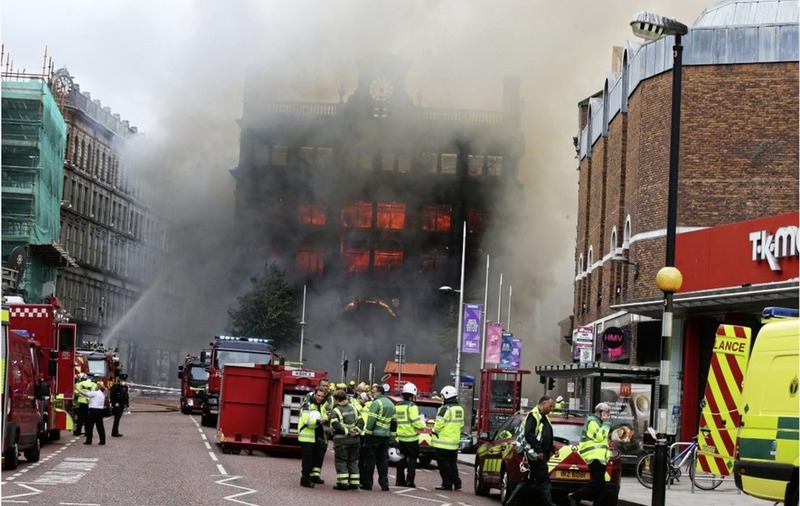 "Up to 100 Firefighters have been at the scene of a major fire at the Primark building in Castle Street, Belfast today," a spokeswoman said last night. By 6pm it was announced that Donegal Quay would be closed to allow the fire service to run a hose from the Lagan River to assist in fighting the blaze. In addition to the fire appliances, there were also a high volume pump, three aerial appliances and two command support units in attendance. 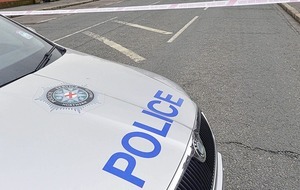 "Whilst the incident is ongoing, NIFRS wishes to reassure the public that contingency measures are in place to ensure normal service delivery is maintained across Belfast," she added. Shoppers and office workers gathered at the ever-widening edges of the cordons, many filming and photographing the devastation and the frantic efforts to stave off complete collapse. Primark staff were among those gazing in disbelief at the destruction of the building they had been in little over an hour before. Northern Ireland Fire and Rescue Service (NIFRS) deployed a mobile command centre and two turntable appliances as they battled the blaze which appeared to spread from the right-side of the building to the left. Several rapid response paramedics were on standby on Castle Street as police officers and gas engineers alongside firefighters on the frontline were given breathing masks to protect from the smoke from the 18th century building which is understood to contain asbestos. 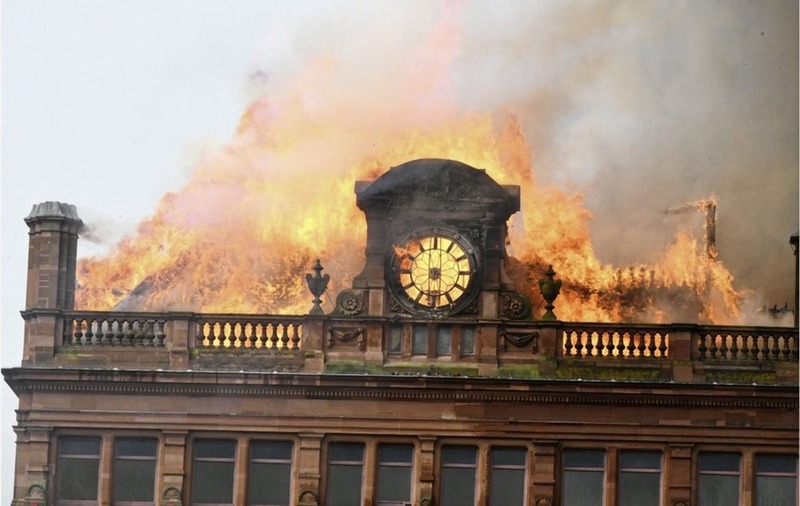 At times it appeared that they were winning the fight, however, the fire repeatedly roared back to life, scorching away the roof as flames burst through the distinctive clockface, before descending, floor by floor, blowing out windows and dislodging pieces of masonry as it went. The city centre was rocked by explosions as gas cannisters inside the building ruptured. 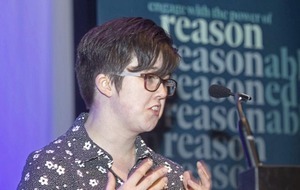 Joan McCoy, President of the Royal Society of Ulster Architects described it as "a sad day for Belfast". "Thankfully, there are no reports of any injuries arising from this major fire," she said. "Buildings like these help give Belfast its unique identity and character. 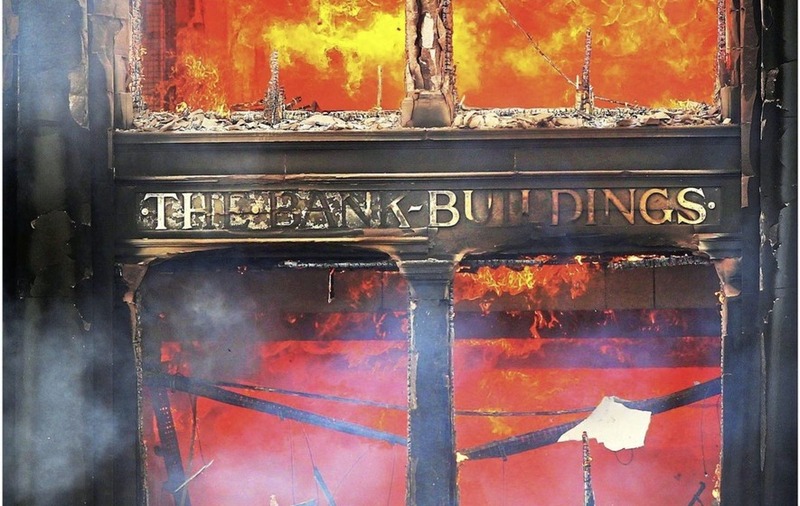 The Bank Building is a very important part of the city's architectural heritage and is loved by many. "This building has survived bombs and fire before. 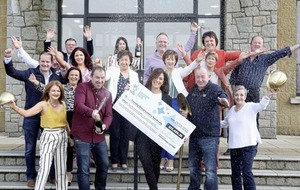 We can only hope that the damage is not too severe and that the building can be saved." SDLP councillor Tim Attwood described the scenes as "devastating" as he urged people to avoid the area. 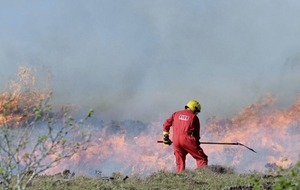 "My thoughts are with the staff and the emergency services who are currently battling to control the flames," he said. UUP councillor Jim Rodgers praised the bravery of firefighters in what he described as "scenes reminiscent of the Troubles". 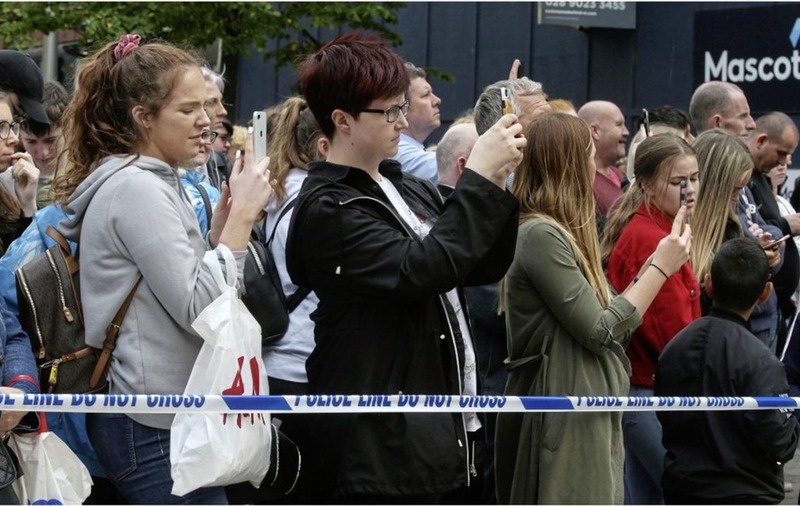 "I spent several hours at the scene of the fire at the Primark Store in Belfast City centre on Tuesday afternoon and like many onlookers could scarcely believe what I was seeing. "Once again the men and women of the fire service are due high praise for their professionalism and bravery in tackling the situation and ensuring the safety of both the general public and property." 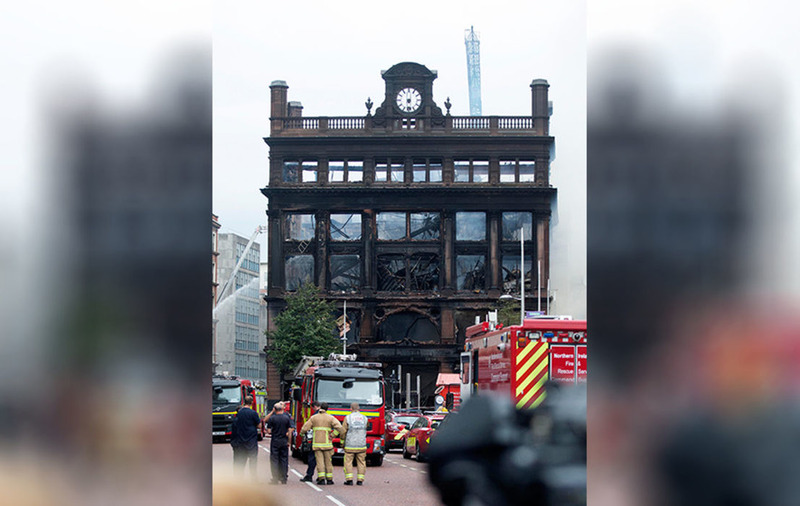 In a statement last night, Primark CEO Paul Marchant said: “We are deeply shocked and saddened by the fire today at our Bank Buildings store in Belfast city centre. The safety and wellbeing of our customers, colleagues and construction team is of course the most important consideration and we are truly relieved that all were evacuated safely. 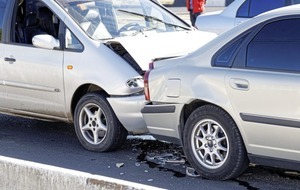 We would like to thank the emergency services for their swift response and ongoing actions. 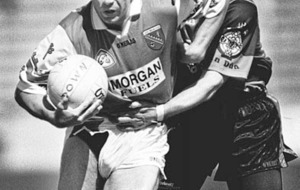 "Our store is housed in an iconic building and much loved by the people of Belfast. We would like to reassure our customers, colleagues and the wider community in Belfast that we are committed to working with the authorities and our building contractors to establish the cause of the fire.